Have you been trying really hard to cut down on your diet and work out endlessly but none works for you? Your weight is stagnant and your body can't seem to lose any more weight? You wanted to shed those fats off and no longer have 'Thunder Thighs' nor "Butterfly Arms"? How about the 'love handles' around your waist? You wanted to buy that M size shirt so badly because they do not have your size? You tend to give up halfway because lack of motivation and discipline? Took too many expensive pro-claimed slimming pills that are at the expense of your own health? Or simply, it's too tough to go on even though you hate what you see in the mirror. Most of the time why your weight loss work out don't work is because you don't enjoy doing the boring routines over and over again. This is why women who went through our program consistently lose weight and keep those fats off. Because they have found a fun and supportive group of people to achieve their weight loss goals together. Learn the basic self-defense skills while losing those stubborn fats off your body. No strict diet and restrictions to follow throughout the programme. Lose the pounds off in a SLOW, SAFE and STEADY manner using Muay Thai techniques. No rebound of weight loss. Enhance physical appearance and fitness level. Improve your body age and feel younger! However, DO NOT take my word for it. 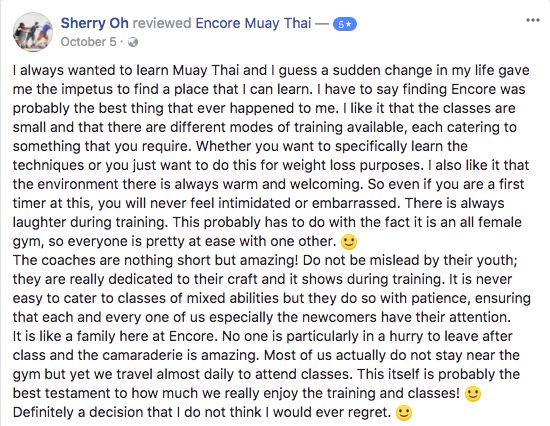 I'd like you to experience how easy it is to lose weight via Encore's Weight Loss Muay Thai Boot Camp in a FREE Trial session with us. "Hi, My name is Vivian and I'd be your personal coach to assist you. This is how I am going to do it. Firstly, I will understand what are your difficulties in weight loss and exercise, your dislikes and likes, your strength and weaknesses. After which, I will proceed to do a Body Analysis Test for you. Don't worry, It's 100% FREE-of-charge. Then I will customize a Weight Loss Muay Thai Programme instantly specially just for you and we'd get into action right away. Coach Vivian is affiliated to Singapore National SanDa Team. She participated in various competitions and have won numerous champions. She conducted countless weight loss and Muay Thai Workshops in schools in Singapore. Graduated with a Bachelor in Exercise and Sports Science and also the Founder of Instant Pain Relief Singapore, she knows how to protect your health at your best interests. She was also invited to be the speaker at Health Science Authority for Fitness and Health Talks. She also attends to patients at Sports Solutions when needed. P.S. ​She has a body age of 18 when she's actually 24 years old! Amazing! 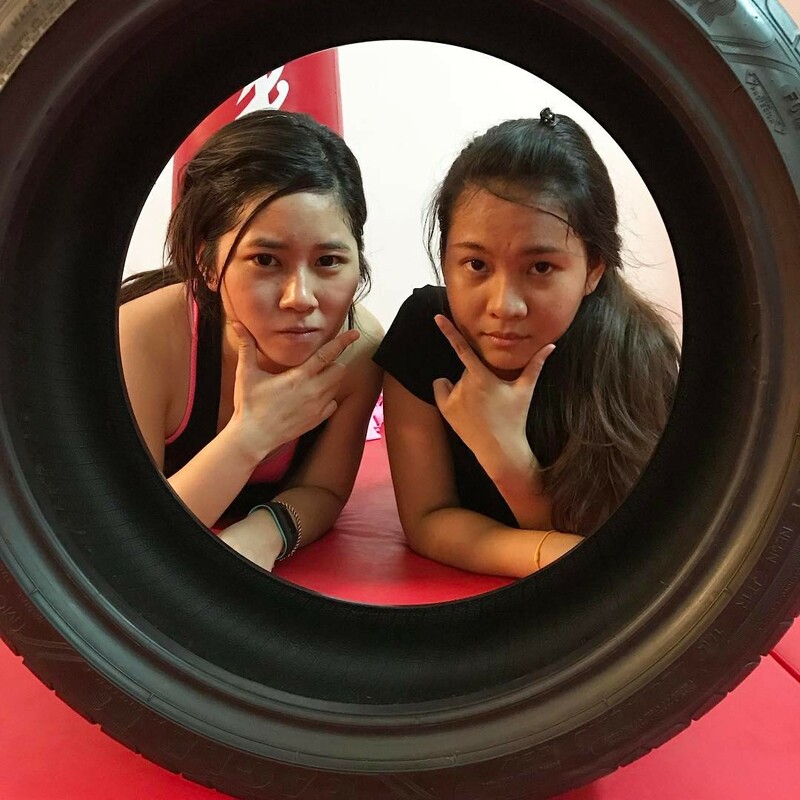 Coach Natalie practices Muay Thai together with Legendary Master Johnnie since the tender age of 16. Being featured on The Newpaper, she's well-known for waking you up into reality. "It's time to fight for yourself. Push on. Dreaming won't make you lose weight, taking action does." She lost 23kg from just Muay Thai alone, from 78kg to 55kg. That's incredible! Looking forward to have you in my Fitness Bootcamp! Let's all work hard and train hard together to shed those pounds and get into a better shape in 2017!